Although it's been one of the market's darlings for a decade now, dividend-oriented investors have long shunned computer giant Apple Inc. (Nasdaq: AAPL) because, well … it didn't pay one. That, coupled with AAPL's historically high share price, has always kept me from buying Apple stock – but, as a trader, it hasn't kept me from generating income with Apple options. Last week, the cash-rich company finally took a step toward rewarding loyal shareholders by declaring a dividend – a quarterly payout of $2.65 a share, beginning with the fiscal fourth quarter, which runs from July 1 to Sept. 30, 2012. Fortunately, by using options, you can easily generate some significant income while waiting for Apple's new dividend to kick in – and multiply your yield at the same time. The first inclination for most option investors wanting added income would be to buy Apple's stock and then write covered calls against it, as described in Money Morning back in January. However, at Apple's recent price, purchasing even 200 shares would cost you $120,500 – or $60,250 if you bought on margin. That's a large chunk of change for most investors. And while selling two nearby out-of-the-money calls – say, ones with a $610 strike price expiring on April 20 – would bring in $3,650 (they were priced at $18.25 last Thursday) to offset a bit of the cost, you'd still face substantial risk. Should Apple drop to $584.25 – a distinct possibility given the stock's recent sharp advance and its high volatility – the income from selling the calls would be wiped out. And, if the stock dropped to, say, $560, you'd lose an additional $4,850. If Apple instead continued to move higher, also highly possible, your stock would be called away at any level above $610. That wouldn't be terrible – you'd make a modest $1,500 profit on the stock ($610.00 – $602.50 = $7.50 x 200 = $1,500) and get to keep the $3,650 in option premiums – but you'd forfeit your chance to collect the future dividend. Given those scenarios, I prefer an alternate strategy for generating income from Apple – one that doesn't even require buying the stock. It's called a short "option strangle." You simultaneously sell a deep out-of-the-money put option – one several strike-price levels below the current stock price. So long as the price of the stock remains between the strike prices of the calls and puts you sell on the expiration date, you get to keep the entire premium you received for selling the options. Because it's so widely traded, currently has such a high share price and has made such a large advance over the past four months (up $238.93 since Nov. 25), Apple is ideally suited for this type of play. It has an extremely wide range of available option strike prices, and the premiums on even the deep out-of-the-money calls and puts are extremely rich. As an example, late last week, when the stock stood at $602.50, the April $640 call – $37.50 out of the money, with just 30 days of life left – was priced at $8.30 per share, or $830 for the full 100-share contract. Similarly, the April $560 put, $42.50 out of the money and also expiring in 30 days, was quoted at $6.60, or $660 for the full contract. Thus, selling two of each would have brought you a total of $2,980 ($8.30 + $6.60 x 200 = $2,980) – money that would be yours to keep if Apple's share price stands anywhere between $560 and $640 a share when the options expire at the close on Friday, April 20. The trade's not cheap – the minimum net margin requirement would be $16,600 on the sale of the two calls and $15,600 and on the sale of the two puts, or $32,200 total – but it's far less than the cost of the stock itself, even if purchased on margin. And, the potential return would be far greater: a profit of $2,980 on a $32,200 investment, or 9.25% – in just 30 days. Annualized, that's a return of 112.59% – and, you can turn right around and do it again, selling a similar strangle positioned around Apple's share price in late April. How to trade Apple's "Profit Zone"
Of course, as the accompanying table illustrates, the trade is not without risk. However, Apple's share price would have to move above $654.90 (the $640 strike price of the call, plus the total premium of $14.90 received for selling both options), or below $545.10 (the $560 strike price of the put, minus the $14.90 premium) before you started losing money. That gives you a "profit zone" of $109.80 in which the stock can trade over the next four weeks or so – a lot of "room to move," even for a volatile stock like Apple. If you want a wider profit band, you can do a short strangle using more distant expiration months. 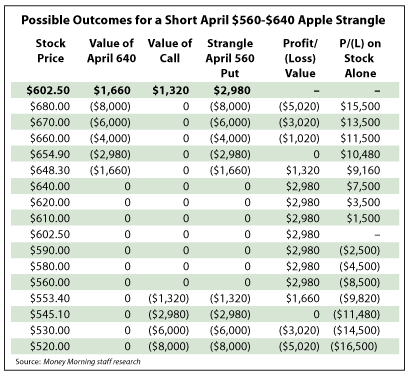 For example, at the same time last week, with Apple at $602.50, you could have sold a May $550-$650 strangle for a total of $28.65, or $5,730, getting a "profit zone" from $521.35 to $678.65. Of course, that trade would extend an extra 28 days, until the May options expire on May 18, giving Apple more time to make a bigger move. Personally, I prefer sticking to shorter-term options and repeating the trade after each expiration. That way, you capture the most rapid erosion in the time value of the options you sell. 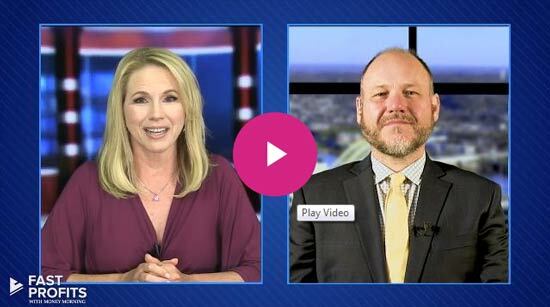 Time is indeed money in the options markets – and, as a seller, you want to get as much cash as you can for selling as little time as possible. Short strangles will work equally well with many lower-priced stocks, so long as they have enough volatility to offer decent option premiums over a range of six or eight strike prices. They can also be used with widely traded options on various indexes such as the S&P 500 and the Nasdaq 100, or on exchange-traded funds tied to those indexes – e.g., the SPDR S&P 500 Index (NYSEArca: SPY) – working especially well whenever we're experiencing uncertain or choppy market conditions. The point is you don't necessarily have to go hunting for dividend-paying shares to generate an income stream from the stock market. Strategies like short strangles, covered calls and cash-secured puts can give you the same — or, frequently, even better results. There's a name for what you suggest: Gambling. True, but don't bother reading about equity investment if you don't like gambling.